The aim of the National Pool Lifeguard Qualification is to teach learners a wide range of lifeguarding related skills, that will be required in a leisure centre facility. The ﻿RLSS UK﻿ National Pool Lifeguard Qualification (NPLQ) is the most awarded lifeguard qualification in the United Kingdom and Ireland that complies with the industry guidance contained within the HSE publication 'Managing Health and Safety in Swimming Pools' Generally, the NPLQ is a recruitment requirement for a number of jobs from Pool Lifeguard to Centre Manager. On successful completion of the course you will be fully qualified to work as a Pool Lifeguard. 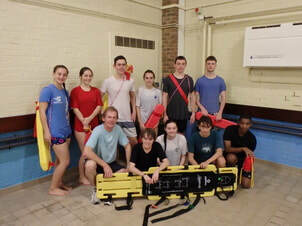 The NPLQ covers all elements of Pool Rescue Techniques, Lifeguarding Theory, First Aid and CPR. The course is physically demanding and will include swimming to set times, lifting casualties and diving to the deepest part of the swimming pool. Training and assessment for the NPLQ is in three sections and all must be successfully passed to attain the qualification. 100% attendance is required. There is also an opportunity to travel with this qualification as it is recognised by the International Life Saving Federation (ILS). For more information email info@swimuk.org for the ILS application form. Assessment for the NPLQ takes place at the end of the course. If you do not successfully complete one or more sections of the assessment, you have 28 days to be reassessed. All re-assessments organised by Swim UK will take place in Brighton. Please see the Swim UK NPLQ Re-Assessment Policy for more information. Some qualifications will exempt learners from sections of training and assessment. Original certification should be provided to Swim UK prior to the start of the course. Please contact Swim UK for more details if you believe you may be exempt. At least 16 years of age at the start of the course. Able to swim a minimum of 100 metres on their back and front continuously. Able to swim 50 metres in 60 seconds. Able to dive to a depth of 3 metres. Able to swim efficient breaststroke and have some knowledge of sidestroke. In order to perform lifeguard duties candidates must be physically fit, have good vision and hearing, be mentally alert and self-disciplined*. Please ensure you have read the "Booking Procedure & Conditions" and "NPLQ Re-assessment Policy" below before booking.